straps. 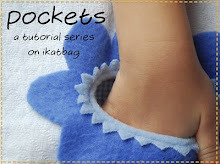 This is not an easy project to sew, and even harder to explain. than it might have needed to be. -- Two rectangles 23" x 4"
A piece of fusible interfacing 22" x 3"
Place the interfacing shiny side down on the wrong side of one of the rectangles so that there is 1/2" border of fabric all around the interfacing. Run a hot iron over the interfacing, bonding it to the fabric. In the picture below, this is the top rectangle. 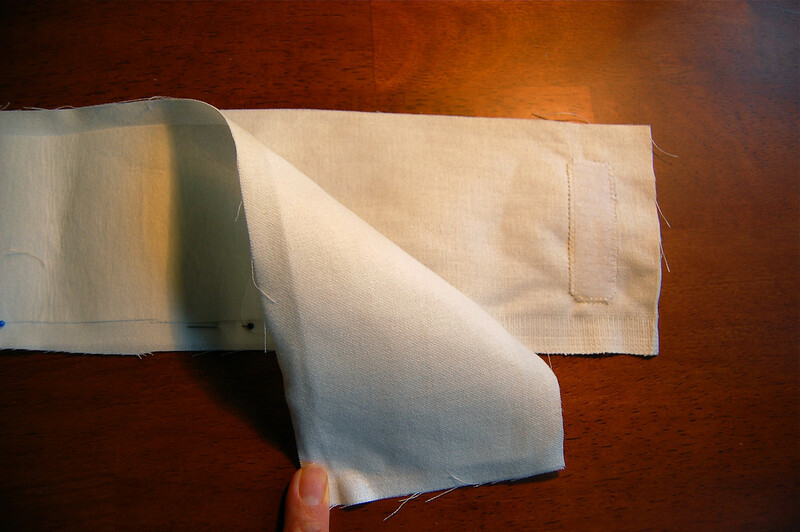 Sew around the edge of the velcro pieces to attach them to the fabric. Place the other fabric rectangle right side up. Place the piece of hook velcro parallel to one short side of this second rectangle. Position it 3/4" from the short edge and center it vertically. Pin and sew the edges to attach it to the fabric. In the picture below, this is the lower rectangle. You will be working entirely on the 17" fabric circle now. 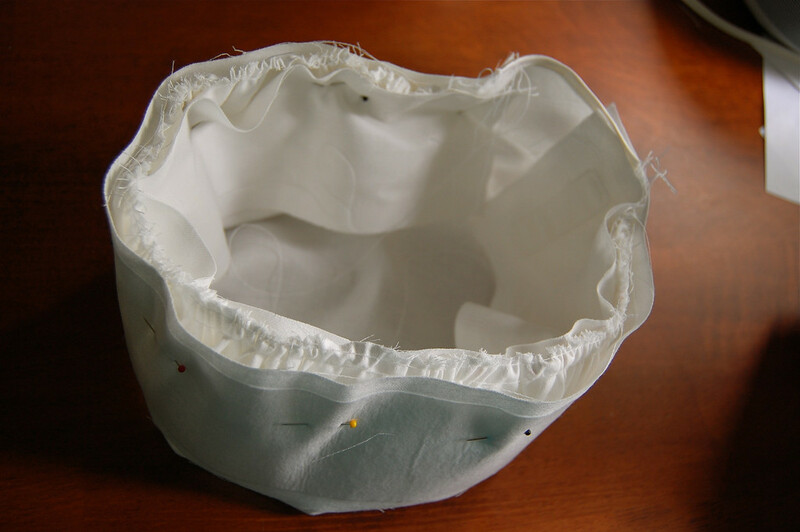 Take the 4" bit of bias tape and sew it onto the circumference of the circle like you would attach bias tape to any raw edge. It does not matter which section of the circumference you pick. 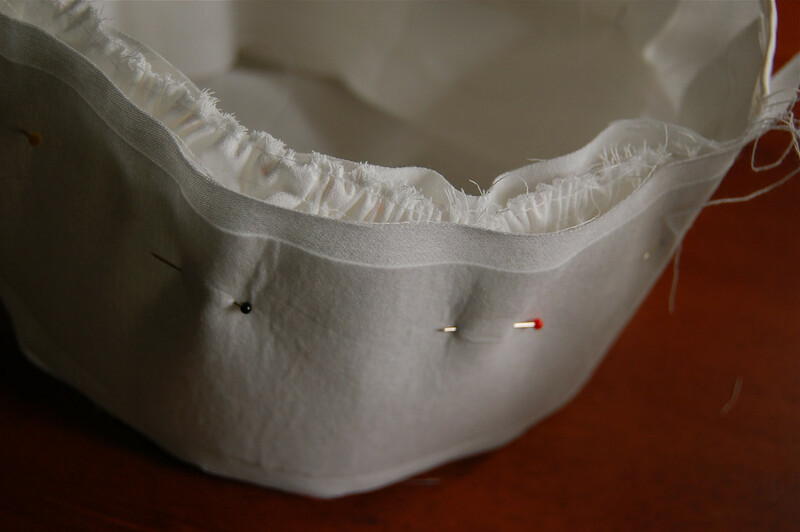 This will be the part of the circumference that will be eventually be exposed within the adjustable region of the headband, and you want it to be finished rather than fraying. Set your stitch length to the longest possible (6 on my machine) and sew one line of stitches 1/8" from the edge and all round the circumference except where the bias tape is. In other words, start sewing just next to where the bias tape ends, and go round till you reach the other end of the bias tape and stop. 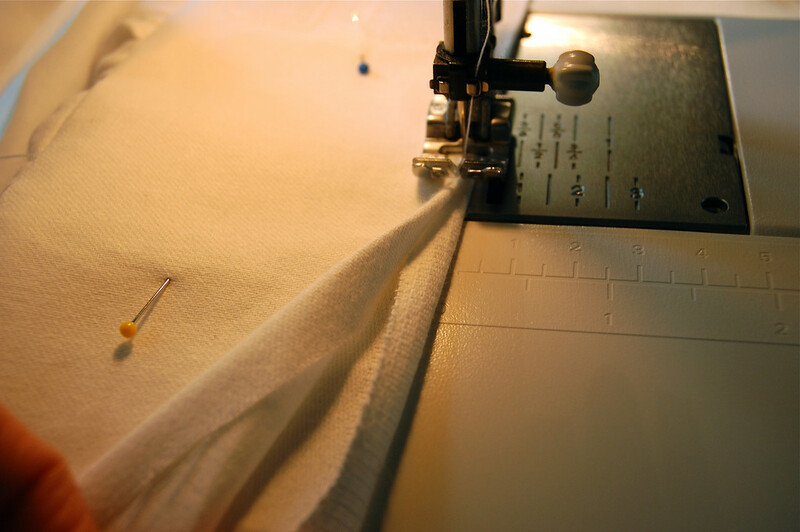 Leave at least 4" of thread trailing from the bobbin and the needle when you cut the threads. You will need this length of thread for gathering the fabric later. 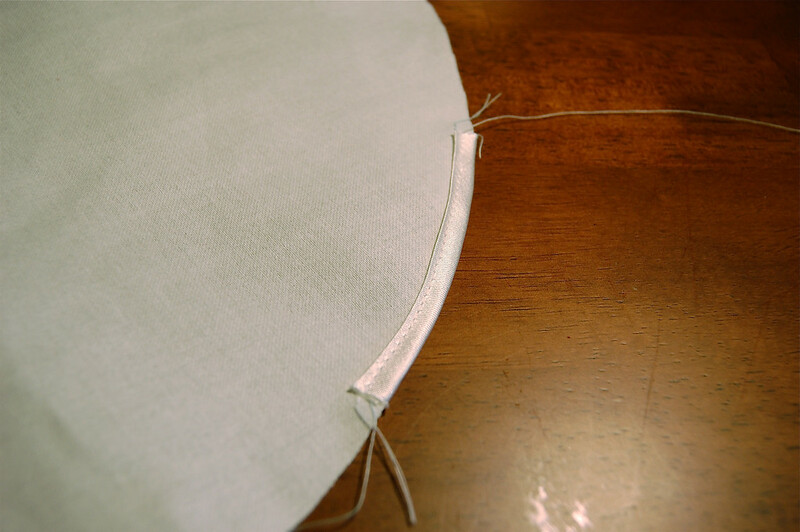 Sew a second line of stitches about 1/4" from the first (and further in from the edge) all around the circle, again avoiding the bias tape. Again leave 4" of trailing thread when you cut. 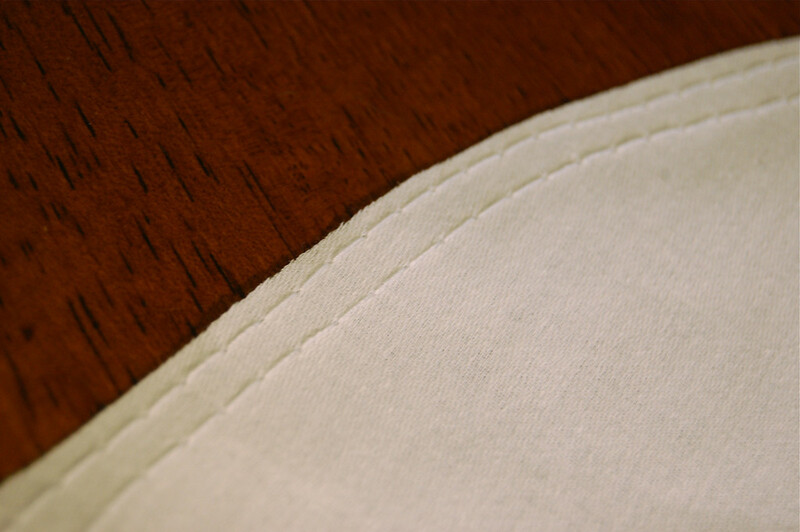 Adjust the stitch length back to normal. 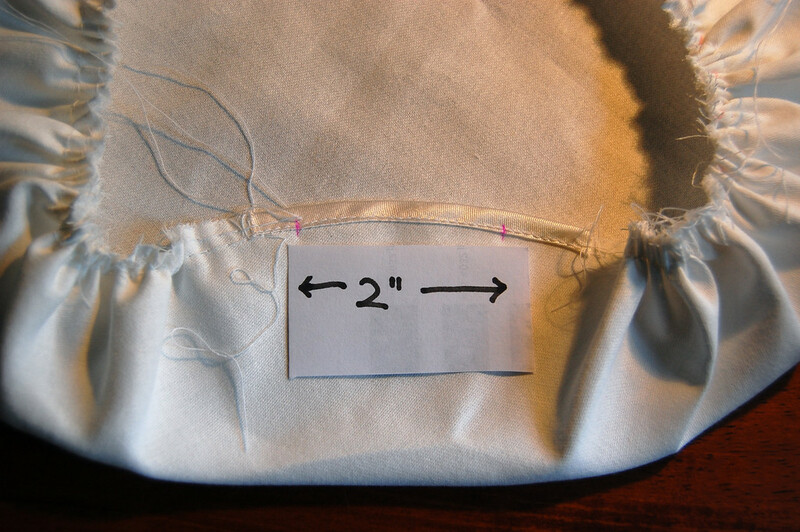 The picture below shows a section of the circumference with the two lines of stitching. 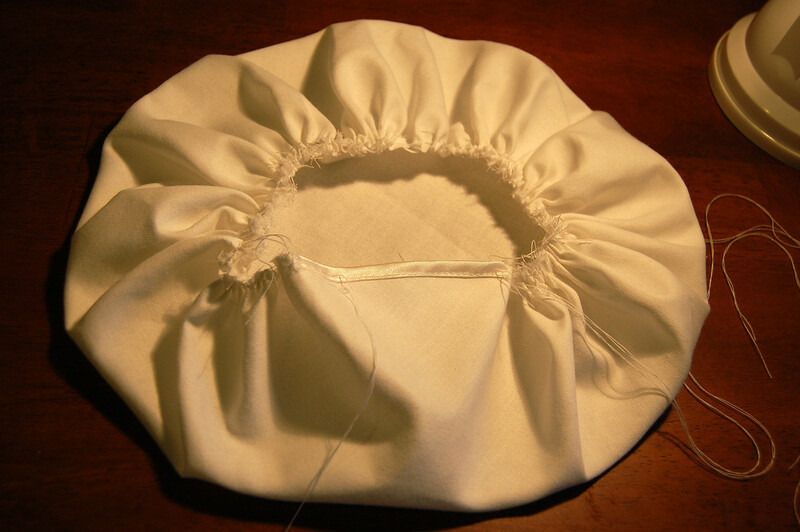 With one hand, take either the upper or lower threads from one end of both lines of stitching and pull gently, while gathering the fabric with the other hand so that the edge of the circle begins to pucker and curl inwards. 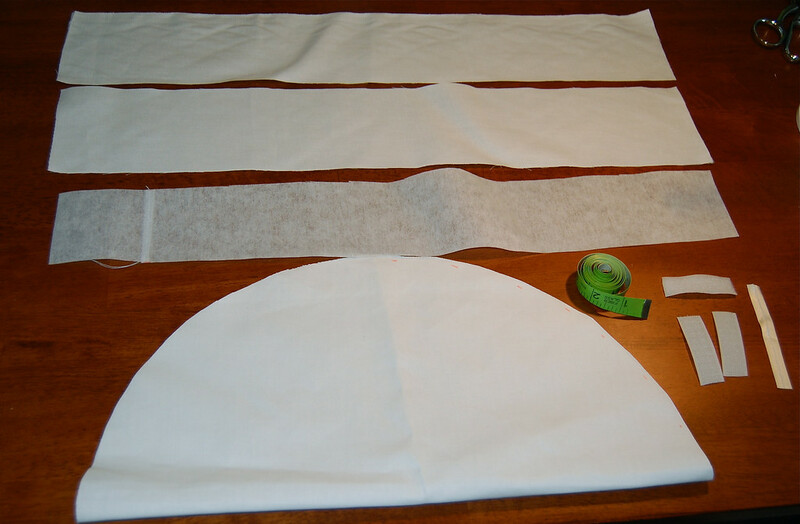 Work till you have gathered the fabric evenly around the circumference - the section with the bias tape will alone remain ungathered. It might help to do half the circle at a time, pulling the threads from both ends of the double line of stitching to gather the whole circle. You can see the long trailing threads on either side of the bias tape section where they've been pulled to gather the fabric. Measure a section on the bias tape that is 2" long as shown. Mark the boundaries of this 2" section. Try to make it as centralized as possible i.e. with about 1" on each side of the marks (shown in red). 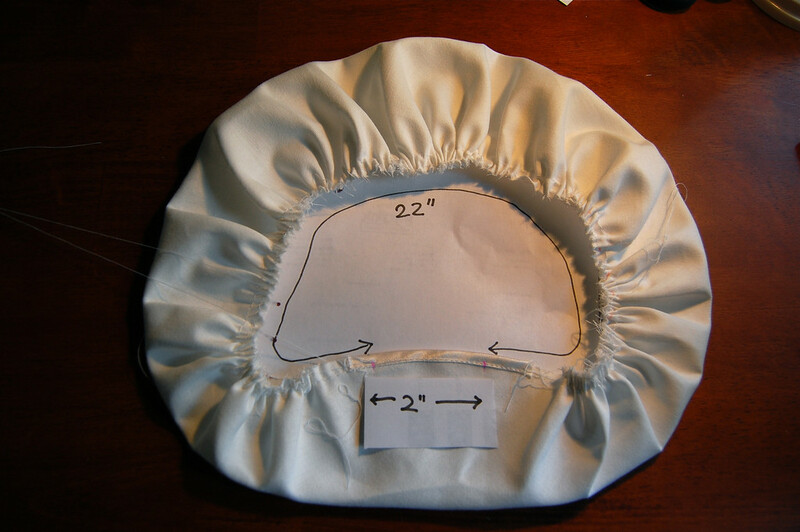 Because this crown (aka shower cap) needs to fit the headband (22" long) we sewed in the earlier steps, we need the circumference of the gathered circle to be 22". So now you have this shower cap thing that has a 24" opening: 22" of it is gathered fabric, and 2" of it is a bias-tape covered straight edge, right? Knot the trailing threads (the ones you pulled to gather) in such a way that the gathers can no longer be loosened. You want the opening to stay 24". The crown is now finished! This part is fast but could be confusing. This is a good time to make a cup of strong tea (or coffee) and wash it down with vast quantities of high quality dark chocolate. You are going to sandwich the crown between the two rectangles that form the headband. The important thing to remember (and which will save much gnashing of teeth later) is that the velcro ends have to be opposite. 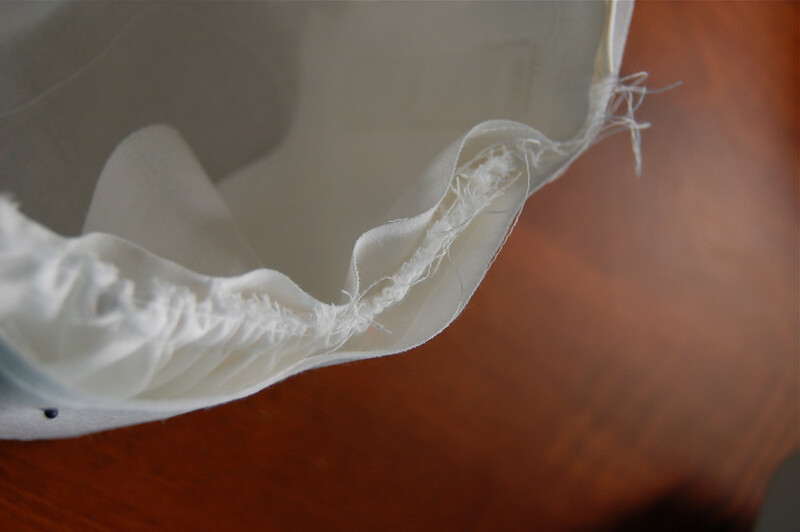 Perhaps the picture below might help explain: ignoring the pins - they are there to keep the fabric from separating inappropriately - one rectangle (the one below) has velcro at its end and the other (peeled back) does not. Pin all the way around the edge of the crown so that the other short edge of the rectangle ends 1/2" beyond the other red mark on the bias tape. -- the same red mark that you began with the first rectangle is 1/2" from this short edge of the second rectangle. In other words, the two rectangles are lined up but one is outside the crown and the other is inside. Pin all the way around the crown. The picture below shows a close up of the three sandwiched layers: inner rectangle, gathered crown, outer rectangle. Sew a line of stitches 1/2" from this edge all along the length of the rectangle, stopping 1/2" from either end. 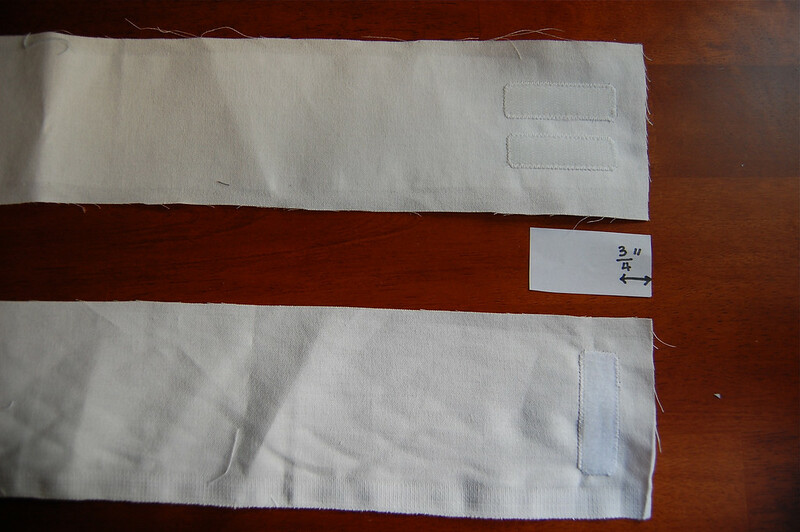 the headband that has one long side sewn and the other long side and both short sides unsewn. 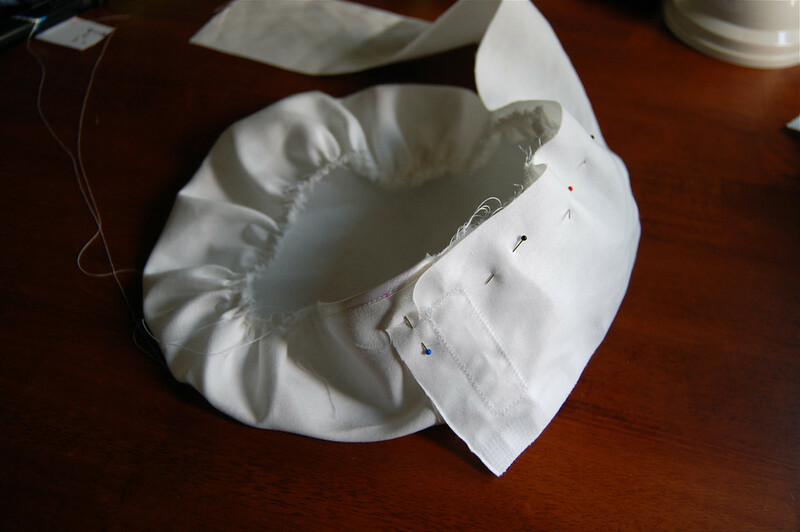 In this step, you are going to sew up the three unsewn sides of the headband by folding a 1/2" hem all round and tucking the raw edges of the fold between the two rectangles. 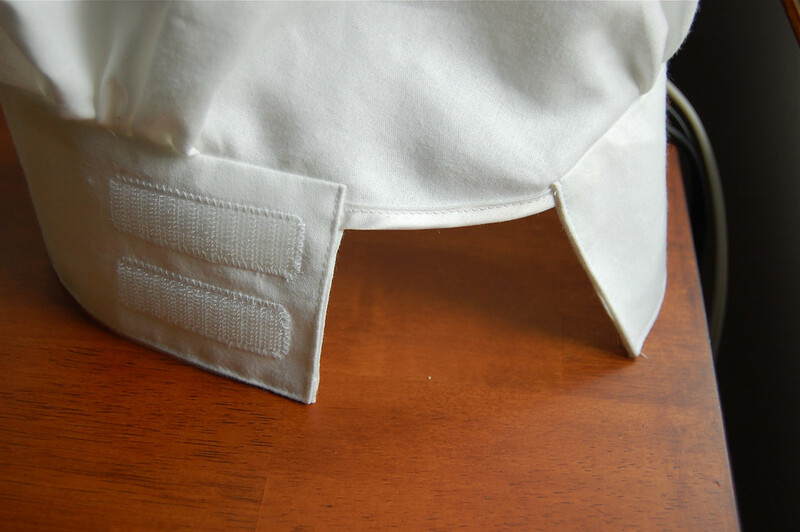 Fold in the corners as neatly as you can. Top stitch all round these three sides. 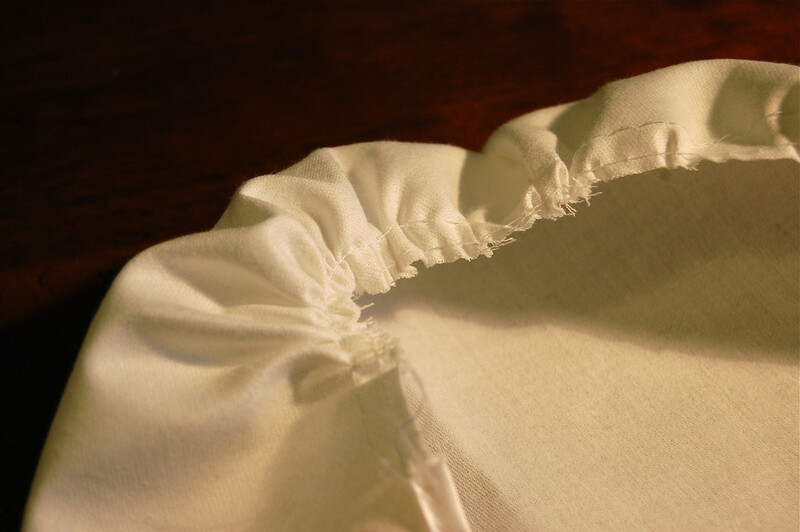 The picture below shows the edges folded in 1/2" and stitched over. Very clear instructions! You didn't make it more complex, what. Really like how you made the adjustable part so simple but effective. I am so done with tutorials for now. It's nice to be teacher again but all that photo-taking does detract from the fun of actually making. 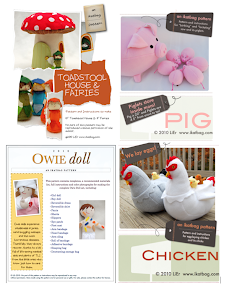 Maybe more tutorials (and simpler) later in the year but for now, there are Christmas projects to start! Can't wait! Thank-you so much for the great pictures and instructions. This is just what I was looking for. I'm getting my two little girls a big play kitchen for Christmas and I wanted to make them matching aprons and chef hats. I had no idea where to start with the hat, so I'm so glad I found this post. I tried it out tonight and the little hat turned out perfectly, thanks to you. Thanks so much for posting this. My 11 year old daughter and I made this today for her Chef Halloween costume. It is not as perfect looking as yours, but it turned out great and my daughter loves it. Your instructions are very good and easy to follow. The pictures are a helpful bonus. Thanks for sharing your skills and creativity. I don't know how I found this tutorial now - but I'm very glad I did. I made this hat last night for a birthday present for my son's kinder friend. Now I don't want to give it away! Thankyou - I can see this becoming a birthday staple - especially for little boys. And I thought your instructions were very clear and easy to follow. Thanks again. I made this for my 3 year old niece. Thanks so much for the instructions - they were perfect!! Thanks for this wonderful tutorial. My DD had to dress up as a "community member" for her talk at school. She chose to be a baker - along came your tutorial to the rescue! Thanks for the instructions. You obviously worked very hard on this tutorial. I hope you get some satisfaction that years later people are still finding it and using it to make their own kids something fun. My 6yo chose to be a chef for Halloween this year and this is PERFECT and simple. Thanks again! Thanks for all your hard work in making this tutorial. I hope you find satisfaction in that, years later, people are still benefiting from your effort. My 6yo wants to be a chef for Halloween and this is PERFECT and you've made it so simple. Thanks! 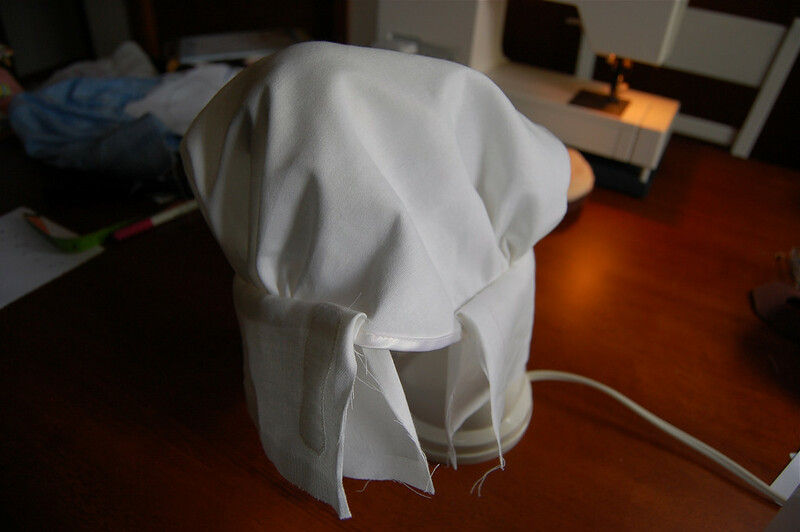 Thanks to your so clear instructions I have made a beautiful chef's hat for my grand-daughter. Thank you very much! I found your pleated skirt tutorial which I might be adventurous enough to try in the morning because I came back from the mall today without anything satisfactory for my daughter to wear. Finding this hat tutorial was an added bonus! 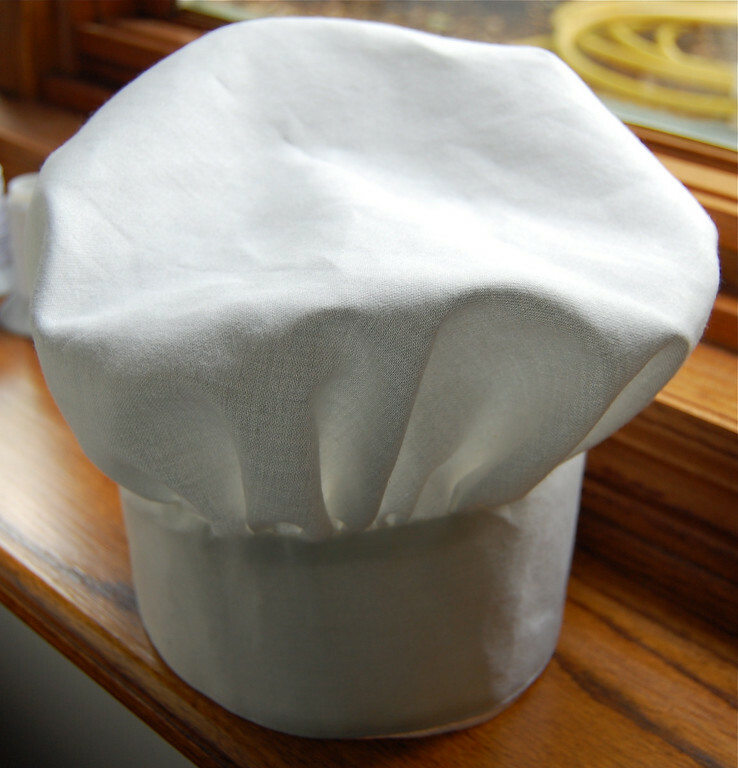 My son just mentioned how he'd like a chef's hat. Just in time for Christmas giving! Thanks again! Perfect!!! 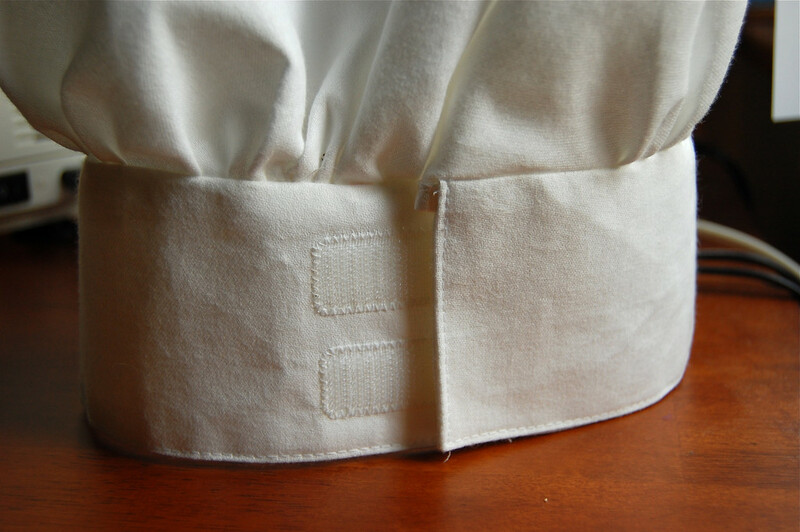 A friend just ordered 4 apron/chef hat sets. Abs...I've never made a chef hat. Lol. Thanks for the great tutorial!!! J'ai trouvé ici les explications qui me fallait pour réaliser une toque et un tablier pour mon neveu. Awesome and very clear tutorial! My daughter wants to be a chef for Halloween and this hat will be perfect! Thank you for taking the time to post it! Hey, Thanks for posting this lucid tutorial. My 9 year old daughter's "Fun-in-the-kitchen" birthday party would not have been complete without this. 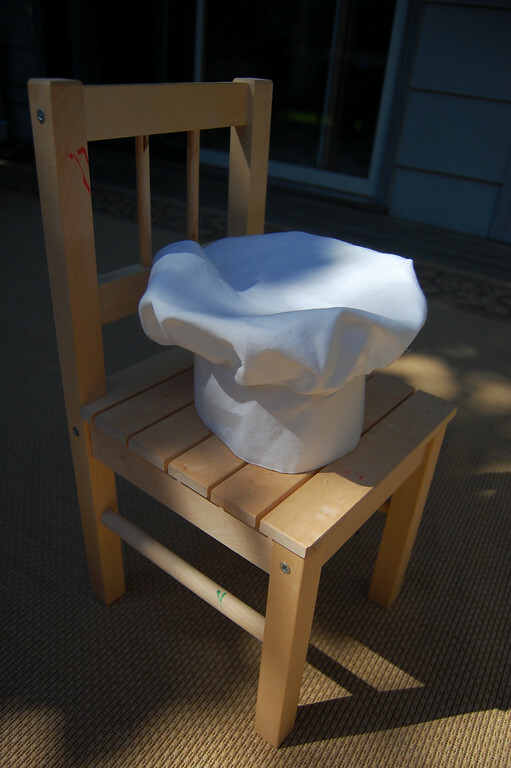 We made 25 of these chef hats for all the invitees; and the kids loved taking this as their return gift. Do you think this could fit an adult too? Wow- 25! What an awesome party it must have been! Am glad the tutorial was a help for you! Hi, I just made the first of three for my two granddaughters and my daughter. Good thing we measured my granddaughter's head or it wouldn't have fit, she has a big head! It shouldn't be hard to make the band bigger for hers. Thanks for your directions and Merry Christmas to you and yours! duhmom: thank you! And you're right about the size - I don't think that pattern would fit my daughters' heads now (they're 7, 5 and 3). It's even small for the 3-year old. I haven't made another hat since that time when I made the pattern. Am glad you figured out the right size for your granddaughters. Merry Christmas to you, too! Very good! Just a tip to everyone, on Step 14 when you sew the three unsewen sides together, go and iron the pieces in so they fold. It makes it a million times easier to sew it! Four years later and it is still beneficial. This is great! Thanks for pics and instruction. It helps me see exactly what you were describing. I also appreciate the feed back from other people. Can't wait to check out more on your cite. I love both your hat and apron pattern. So far I have made 5 aprons and 2 chef's hats. I have 1 more kids apron to make. And I plan on adjusting both patterns to be adult sizes so both my kids and I can wear our chef's attire while creating in the kitchen. Thanks so much for the tutorial. I love your creativity. Hey, thanks for this! I want to make my niece and nephews chefs hats for christmas, and I was wondering how I would make it fit their heads properly, but the adjustable part makes so much sense. 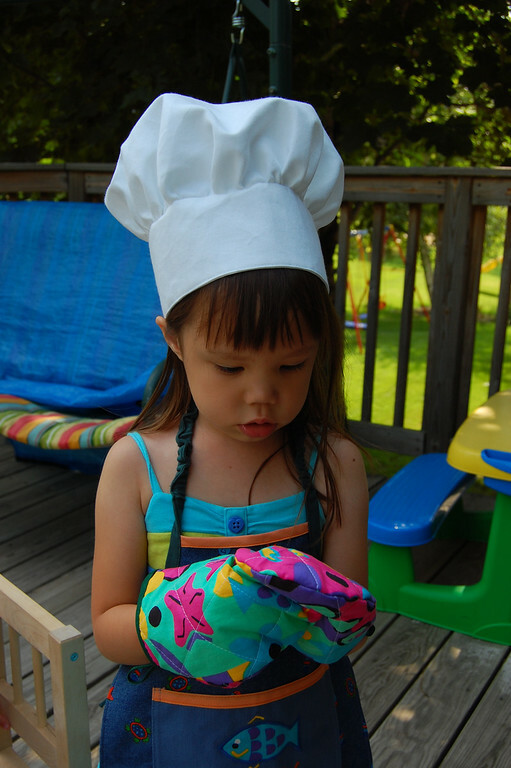 Thank you SO much for the awesome pics and instructions for the adjustable chefs hat! This is so much help! Hello, your instructions are really good, but I've a question: What should the size be, if I make the Chef's hat for an adult? Marta: I daren't say yes, because it is a small hat and I think my kid was 3? when I made it. I think if you made the band longer and the circular crown correspondingly bigger, you'd be able to make an overall bigger hat. I made 6 for special people of mine at Christmas, the first two didn't work great. I found when I stopped pinning the top all the way around and when I stopped tying off the ends (around the circle at 22 inches) and gave myself a little more flexibility with the gathers it worked great. I also made them a bit bigger so that they would fit my kids and me, now we can all dress as chefs together in the kitchen! I found the instructions were great and the pictures very helpful, thanks so much for the tutorial! This is incredibly helpful and so detailed. I am a blogger and I know how much time and effort it takes to write things out and take photos and load them, so I really appreciate the effort that has gone into this post. Fantastic! Thank you very much for this incredibly detailed and meticulous tutorial! I just finished sewing an adult-size version for my dad to wear while he makes pies and croissants. I made a few mistakes due to not reading your instructions properly and trying to freestyle the sizing-up, but I think it should fit him. I would never have figured out how to do this myself, so thank you!